It is a great pleasure to present the new G20/OECD Principles of Corporate Governance that are poised to be endorsed by G20 Finance Ministers today, here in Ankara. This deliverable follows a request from their February meeting and will be transmitted to the Leaders meeting in Antalya in November. The world economy is, again, going through a phase of heightened uncertainty with growth hardly picking up in the euro-area, a substantial slowdown in the emerging economies, and a new bout of volatility on financial markets. The recovery is desperately slow, not least because investment remains below pre-crisis trends: in particular, big corporations are piling up cash instead of putting it to productive use. In this context, seizing the opportunity of the revision and update of the OECD Principles of corporate governance to bring the issue of corporate governance into the spotlight is both a very relevant and timely decision from the G20. It is also testament to the inclusive nature of the revision process – involving all OECD and G20 countries on an equal footing - that resulted in the crafting of those updated principles which are now G20/OECD Principles. 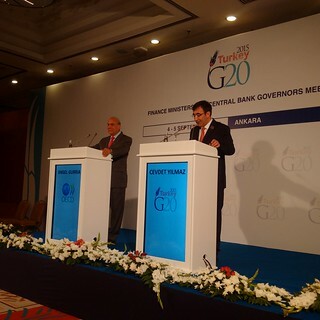 5 September 2015 (from left) - OECD Secretary-General Angel Gurría and Turkish Deputy Prime Minister Cevdet Yilmaz at the launch of the G20/OECD Principles of Corporate Governance, Ankara, Turkey. I said “a very relevant and timely decision from the G20”: indeed, good corporate governance is a means to create a business environment of trust, transparency and accountability in order to support investment, financial stability and sustainable economic growth. The Principles provide policy makers and regulators with the necessary building blocks to create such an environment, based on sound rules and regulations. They address how corporations are directed, how institutional investors manage other people’s money, and how our stock markets should function. Getting issues like executive remuneration, financial disclosure, investor behaviour and stock market practices right, is crucial for unlocking investment, which is one the of the 3 “Is” of the Turkish G20 Presidency. In the global and highly interconnected world of business and finance, creating trust is something that we need to do together. Money and corporate operations constantly cross borders. And let me illustrate with just a few numbers. Today, half of the world’s 50,000 publicly traded companies are listed in emerging markets. And since 2008, companies from emerging markets have attracted more than half (51%) of all equity capital raised in the world. This is a sea change compared to the 1990s, when non-financial companies from emerging markets only raised 14% of all equity capital. The largest US public pension fund [The California Public Employees' Retirement System (CalPERS)] owns stocks in almost 10 000 different listed companies worldwide. More than half of these companies are listed outside the US and 1700 of them come from 22 different emerging market countries. The conclusion is evident: the future prosperity of US retirees will to a large extent depend on the performance and integrity of corporations who are operated and traded in a great number of countries worldwide. In this increasingly interconnected world, regulators, companies, investors and stakeholders need a shared understanding of good corporate governance: A common global language if you want. The new Principles are a response to that need, developed through a partnership between the G20 and OECD. I would like to compliment Mr. Yilmaz and the Turkish Government for their excellent leadership in making this partnership happen. As I said at the start, there are major changes and challenges facing the world economy today; we need to boost investment and increase productivity. We are also fighting stubbornly high levels of unemployment in many countries, growing inequality and an erosion of confidence in markets and governments. First, implementing the Principles will help corporations to access capital, which is a fundamental condition for unlocking corporate investment. The bank deleveraging period since 2008 makes it particularly important that companies have access to equity capital. Looking at developments over a fifty year period, our recent OECD report Finance and Inclusive Growth finds that excessive leverage of and credit to the private sector slows growth in most OECD countries, while more stock market financing has the opposite effect on economic activity. This is why the Principles have a new chapter about the functioning of stock markets, the investors that use them and the consultants that provide them with services. We want to shed light on this increasingly complex universe and give recommendations with respect to the proper disclosure of fee structures, how to manage conflicts of interest and the need for equal access to market information. Second, the Principles are formulated so they can be adapted to company-specific circumstances. This is particularly important for smaller companies with strong growth potential and an ambition to reach the high-end of the global value chain. These companies need to break away from a vicious circle of short-term loans and trade credits that require collateral and constant refinancing. To take risks and innovate, they need long-term patient financing in the form of equity capital. And to get it, they need to meet investor expectations with respect to corporate governance. The Principles provide them with guidance on how to gain the confidence of investors by establishing formal structures of procedures, rights and responsibilities that make outside investors willing to provide money. Third, the Principles are about inclusiveness. Not only do the performance and the integrity of corporations affect the incomes of present and future pensioners. Stock exchange listed companies around the world also provide for more than 200 million jobs. The Principles also recognize the interests of these employees and other stakeholders, and their role in the long-term success of the companies. As more and more household savings find their way to the stock markets, the Principles call for the need to provide them with fair and transparent markets. In partnership with the G20, and in cooperation with hundreds of individuals and their organisations, the priority is now to put the joint G20/OECD Principles of Corporate Governance to good use: Something that is facilitated by the possibility to adapt them to different economic, legal and cultural settings. By providing experiences and expertise, the OECD stands ready to work with governments, national institutions and international organisations to assess the quality of the corporate governance and to support reforms on the ground. So let me conclude by encouraging policy makers, regulators, companies and investors in all G20 and OECD member countries to actively promote the use and implementation of the Principles of Corporate Governance. They were not drafted to sit on the shelf. They represent a tool for change and improvement.